In the pediatrics playroom, the medical team and I, a medical student, hunkered down in child-sized chairs to review patient progress notes. A television screen nearby diverted my attention. 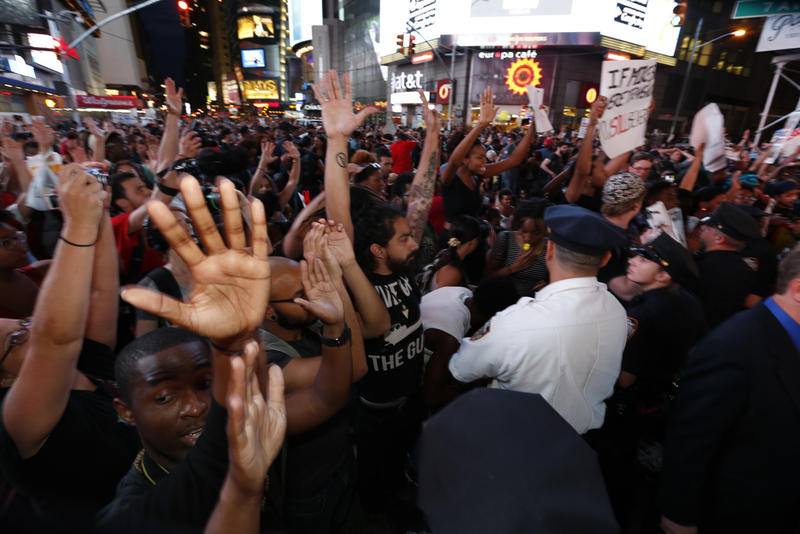 On CNN, video of protesters alternated with Eric Garner’s final moments. The television was mute, but I could hear Garner say, “I can’t breathe …I can’t breathe …” One moment, he is alive. The next, he is dead. The video loops again. One moment, he is alive. The next, he is dead. For days, this loop has been replaying in my mind. I’ve been thinking about the non-indictment of Officer Daniel Pantaleo, who put Garner, an unarmed 43-year-old father of six, in a banned chokehold that led to his death. The coroner called it a homicide. I’ve been thinking about the non-indictment of Officer Darren Wilson, who shot to death Michael Brown, an unarmed 18-year-old high school student. Both officers are white. Both dead men are Black. These were reasonable questions. I tried to engage. I tried to say something about the importance of protest as an articulation of outrage and as a powerful force for social change, about the institutionalized racism and systematic oppression of people of color, about the relentless, daily injustices that erode the spirit. I don’t know if I made sense, but sitting in a miniature chair with toys and coloring books strewn about the room, I found this moment particularly poignant. Working in the Bronx, most of our patients are children of color. Doctors treat their colds and sniffles, as well as more serious conditions like HIV and cystic fibrosis from birth to age 21. These children — our patients — will grow up to be victimized, traumatized, and executed. What kind of society is that? Because of the unanticipated conversation, the context, and perhaps a fear of being labeled as “unprofessional,” I didn’t mention my plans to don my white coat and scrubs to join a peaceful protest later this weekend. Instead, I became quiet and followed the rest of the medical team out of the playroom to begin rounds. In light of recent events, my medical school sent an email to the student body with the intention of supporting us and cautioning that any arrest — even for civil unrest — may be deleterious to our careers. But some things simply must be protested. As a medical profession, we often use the word “non-compliant” in a paternalistic way to identify patients who do not obey our treatment plans. Often, we attribute this disobedience to poor health literacy or lack of discipline. There’s a growing movement to move to the word “adherence,” in which patients actively collaborate with their health care teams to develop a therapeutic plan to follow. For me, protest is professionalism. In both, it’s less about “compliance” and more about “adherence.” This national protest is not about disobeying authority. This protest is about working together to catalyze movement towards a society that is just for all citizens. As medical professionals, we see the inequities arising from racism on a daily basis. While it is a public health issue, we are failing our patients if we do not also see it as a human rights issue. As the Rev. Dr. Martin Luther King, Jr. said, we have been given “a bad check” in which “it is obvious today that America has defaulted on this promissory note insofar as her citizens of color are concerned.” It’s time for medical professionals to help people cash that check. Christy Duan is a medical student. < Previous post Antibiotics during gynecological surgery: When are they necessary?